Research at Stanford University found that those collaborating on a certain assignment will tend to persist with the task 64 percent longer than solo workers. This outcome, the study suggests, also leads to more enthusiasm, commitment and intrinsic motivation. And all of these have a notable impact on the success of the organization. The purpose of collaboration is to unite a group of people to complete a common objective or goal, in addition to sharing the workload. As such, collaboration is beneficial for employees and managers alike. Learn more about why your team should be collaborating more often and how you can harness these benefits in order to be more productive. When you align with a diverse group of people who offer unique ideas and points of view, you create a more creative working environment. This also allows everyone to get feedback, enabling ideas to develop faster and more effectively. In his book Creativity: Understanding Innovation in Problem Solving, Science, Invention and the Arts, author Robert Weisberg found a common thread between some of the world’s most prolific visionaries. These experts surrounded themselves with others who helped them connect an original line of thinking into a chain of related, fleshed out ideas. This process, as Weisberg suggests, can accelerate innovation. If collaborative work is prioritized, and teams are empowered with the resources to actualize it, coworkers may strengthen connections. Consequently, that enables them to better support one another. In the end, everyone is more productive, helping the business flourish. A wide range of expertise in a team makes it easier to troubleshoot an issue or resolve a conflict as soon as it arises. That is before the project fails or you miss an important deadline. Collaborative problem solving is a framework established by the University of Memphis, and it offers multiple benefits. Finding solutions as a team builds a united purpose, fosters accountability, and allows every team member to use their strengths while working interdependently. There’s a natural synergy between collaborating and communicating. When you’re an active participant in teamwork, you must communicate succinctly and directly with the other people involved. The effectiveness of a project hinges on this communication flow. “Your team members need to be able to express themselves clearly to each other and successfully manage channels of communication,” explain the experts at RISE Beyond. “All individuals need to understand their responsibilities and report on them regularly to others.” This accountability allows everyone to be more efficient and productive. 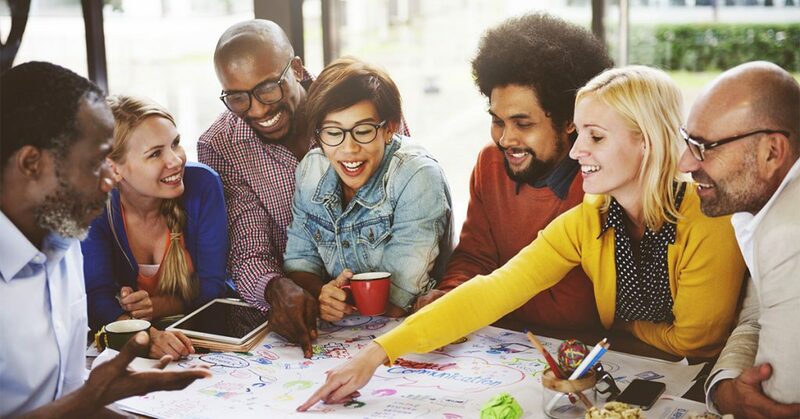 If you’re not collaborating enough at your workplace, use these tactics to start connecting with co-workers and build a cohesive and interactive company culture. Capitalize on individual talents. Maybe one person in the group is extremely creative, for instance, and another is proficient in data analysis. Take into consideration how these particular assets can be leveraged in order to attain the project’s desired outcome. When you emphasize strengths rather than fixating on weaknesses, you embolden and motivate the entire team. Agree on roles, expectations and deadlines. If everyone knows their roles and responsibilities ahead of time, conflicts are minimized on the front-end. Establish definitive criteria about what’s expected from each contributing member to start on same page. Cast a vision that everyone is passionate about. To forge connection between team members, rally everyone around a cause, mission or area of impact. When everyone is compelled by an overarching sense of purpose, it becomes easier to mobilize, inspire and remind each other why the work matters. Delegate the amount of work proportionately. Ensure that tasks are allocated between each team member. This inclusive approach will make everyone feel like a strategic and influential participant, while distributing the workload in a manner that’s feasible and equitable. Socialize outside the office. You don’t need to be friends with co-workers and hang out on weekends, but making time to coordinate or attend teambuilding events and gatherings allows you to connect on a personal level. Knowing how someone functions outside the office can provide insight on how to better work together. A little conversation can go a long way in developing better relationships with co-workers or lower-level employees you manage. Collaboration provides a wide range of benefits for any business, from increased productivity to greater creativity and better problem-solving. Use these tips above to start collaborating more in your workplace, whether you’re an entry-level employee or high-level manager.